Developed by Jiin Feng, Fighting Tiger – Liberal is a martial arts game that can be played on android and iOS devices. The free game app can be downloaded and install on a PC with the help of an android emulator. The main character Gin (Kung Fu fighter) decides to leave his gang, but the gang is not willing to let him go. The gang has captured the fighter’s girlfriend and he has to fight to get her back and also save his life. You will need to employ great fighting styles to accomplish your mission and win the game. The developer has included awesome features that will keep you entertained throughout. Fighting Tiger – Liberal gets you involved in liberal Kung Fu fighting styles such as Sanda, Chinese boxing and Baji Quan. It also allows you to carry out protean attacks that knock enemies down more efficiently. Equipped with a 3D interactive mode, the game can help you learn some Kung Fu and martial arts. You can use kicking, punching, dodge, throwing and catching to defend yourself and grab your girlfriend back. You need to combine these fighting methods to create deadly attacks and intense fighting motion. Combine kicks & punches and keep spamming them to overcome your enemy. 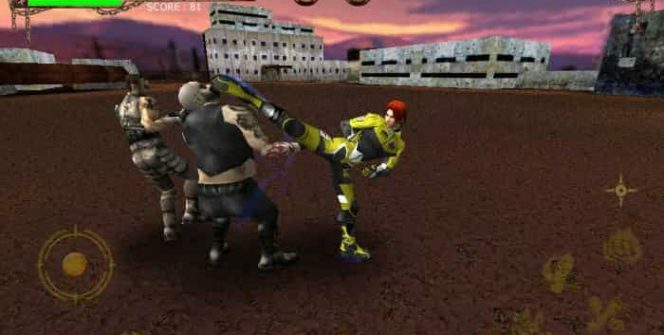 With intense fighting and taking down more enemies, your energy meter will fill up and get stronger skills such as roundhouse kicks, grappling and throwing. You can also tap on the “angry” button to launch invincible and powerful series of attacks on your enemies. The characters are modeled in 3D, making them quite visible and functional. You can kick or punch your foes on all sides, something which will make them wear out faster and succumb to their injuries. The control system is designed with small-screen devices in mind. The developer understands the hassle which comes with playing action-fighting games on mobile devices. It has solved this problem by equipping its game with a sensitive 3D fighting control system. This arrow appears near the main character- Gin to show you the next direction to take. You can follow it if you don’t have some gang members to kill in the current level. It is advisable to ensure your current enemies are 100 percent as they can gain strength in no time and attack you. When your enemies drop weapons and health packs, do not hesitate to take them. These elements stay for a few seconds on the screen, so grab them as quickly as possible. They will greatly help you in the final levels. This action/fighting game is compatible with mobile devices, but it can be downloaded and installed on a laptop or desktop. It’s display, presentation, control and other elements are better on a PC. Get the app on your PC and experience a new world of improved gaming. Sometimes when playing Fighting Tiger, bluestacks ask you fee to pay but gives you option to download some apps. Every time it asks you just select “Install apps” and continue using it free. I hope you enjoyed this guide, please rate and share. If you have problems running Fighting Tiger – Liberal on desktop or any other issues, leave a comment below.